With our function furniture we help you to impress and innovative space solutions and versatile range of chairs, tables, desks, and stools. 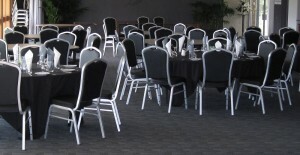 Whether it’s a wedding, party, business event, conference, fundraiser, or entertainment precinct in your club, bar or hotel, our function furniture is quick to set up and pack down and stacks away neatly when not in use. In Australia, outdoor functions are common. We work with manufacturers to ensure our banquet, function and event products are of the highest manufactured quality, made from strong, safe, durable materials, so you can host with confidence.